How do I add a motherbone to my MMD models? Why would I add a motherbone to my MMD model? How can I move my MikuMikuDance model and keep her there without her drifting back to center-stage? Do I use PMDE to add a motherbone? It’s easy to add a Motherbone to your MMD Models! One very useful feature some MMD models have is the motherbone. This is similar to the centerbone/groove bone, but you’ll see it on the floor between the model’s feet instead of between their legs. While the groove bone moves only the upper body, with the lower body dragging along like a rag doll, the motherbone moves the entire model in the same position it already is. This is extremely useful for things like moving models with motion data as the motions and positions go with the model as you move the motherbone, whereas, since the groove bone already has to move for dances and is locked into its relationship with the coordinate grid, it’s pretty much impossible to reposition dancers without a motherbone. BUT WAIT! What about models you are not allowed to edit? Well… I usually do it anyway. Because all you’re doing is adding a motherbone and not actually editing the model, I usually assume it’s ok. Just don’t redistribute it, and you should be fine. I really don’t see any reason for anyone to get mad for adding a motherbone to your model, so I would say go ahead and do it. Just don’t do anything else, and don’t redistribute it. AHHHH THANK YOU!!!!!!!!! YOUR A LIFESAVER!!!! please explain better: what is FMP? The FMP… the bone-chart in the Frame Manipulation Panel. 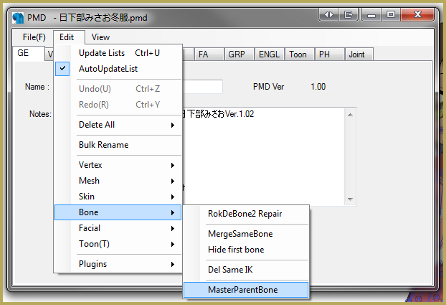 Mother bones… are not part of all MMD models… the Animasa models downloaded with MMD do not have them. And so, yes, the model will drift back, as you say. You can ADD a mother bone to your model … or you can use the Center Position Bias command to move the whole motion to a new position on your stage. No, but you can select the whole IK *group* in FMP, then shift-select the center bone (so that all mobile bones would be selected at once), and then you will be able to shift the model as a whole. Thanks for trying in advance! Thanks for writing this Stella. I’m an ardent advocate for mommy bones (My first article for LMMD was about Mother Bones).